Still in Chicago while it seems like the rest of the music universe is in Austin? 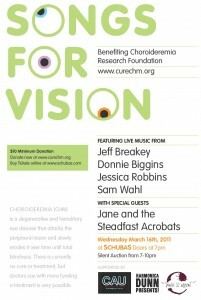 Head to Schubas on Wednesday at 7 pm for a show featuring some stellar local artists and in support of a good cause. 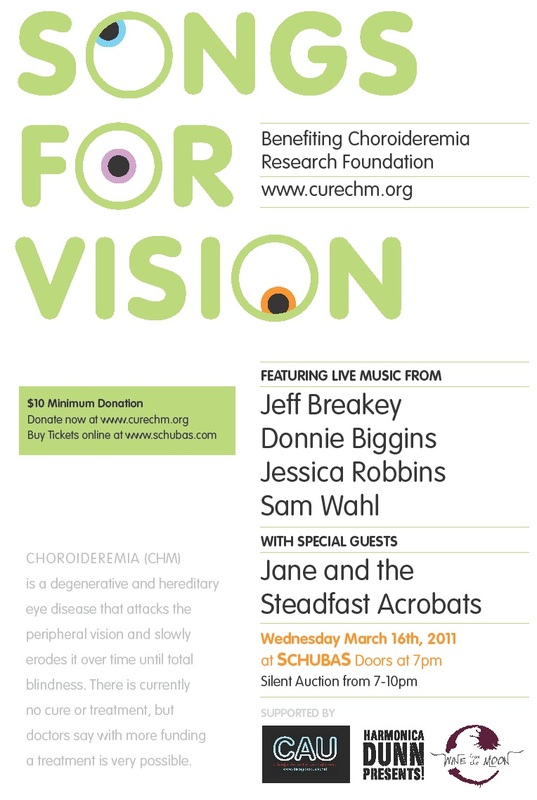 Wednesday’s show, featuring singer-songwriters Jeff Breakey, Donnie Biggins, Jessica Robbins, and Sam Wahl, as well as Jane and the Steadfast Acrobats, is a benefit concert for the Choroideremia Research Foundation (CRF). Choroideremia is a degenerative and hereditary eye disease that attacks the peripheral vision and slowly erodes it over time until total blindness. There is currently no cure or treatment, but doctors say with more funding a treatment is very possible. To learn more about Choroideremia, check out the CRF’s website. The show is asking for a $10 minimum donation, and will also feature a silent auction from 7 – 10 pm.